Today is the 34th Terry Fox run – and the 34th time that I will run in this family event. 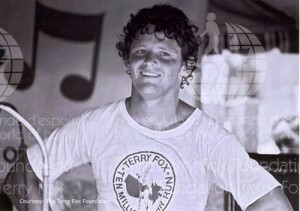 Have you heard of Terry Fox? He is a Canadian hero but people in other countries aren’t often aware of him. 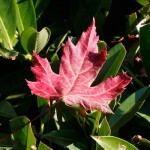 You can read a timeline of facts and much more at terryfox.org. Terry was 18 when he lost his leg to osteosarcoma and he decided to run across Canada to raise money for cancer research. He’d run from St. John’s to Thunder Bay when he had to stop because his cancer returned. In 2010, I wanted to ‘finish’ Terry’s run but got ill myself. Now I’m trying again. Let’s think about this – a marathon every day? If I count up my running mileage, I run a marathon every 2 weeks. To get myself moving, I am going to do some form of cardio every day until I run 3156 km (1961 miles). I’m hoping to get to the point where I run 5 days a week and cycle 2. I’ve started a spreadsheet of my progress so you can follow if you want. You’ll note that I started on Sept. 1, the day that Terry had to stop. Why 3156 km (1961 miles)? Terry Fox had run 3339 miles with an estimated 1961 miles left to reach the Pacific Ocean. I was 11 and promised to one day complete the run. As I grew up, I wanted to do something like him but I’m not naturally athletic and there never seemed to be enough time. Now with internet technology, a virtual completion is achievable. I do not want to take any of the credit from Terry Fox or the foundation but I want to satisfy that idealistic wish from my childhood. NOTE: much of this information is repeated from my 2010 post. But I plan to finish this time so won’t have to recycle again. Know what’d be cool? You plot your distance on a map of Canada, starting at Thunder Bay. Think of the motivation when you’re only a click from Winnipeg, Calgary, Vancouver! Probably some clever way to get Google maps to do it for you. Awesome! what your doing is really remarkable.